Here is quick easy peasy post to remind myself what a lovely Rakhi we had this year. Both my brothers were here and in addition to that the tiny little niece of mine also got a chance to tie rakhi on his brother’s hand. The little brother in question was too excited and made his father take him to the nearest gift shop to buy gifts for her tiny little elder sister. Both of them were overjoyed when we later visited our Uncle's place for their house warming puja and party. After some more tying of rakhis to some long lost cousins we then were fed a scrumptious vegetarian meal. Each and every item was so well made that we went for seconds and sometimes third. It was a beautifu afternoon with family and friends. And if that was not enough after reaching home the sonny boy declared he was going to cook dinner for us. After such heavy meal dinner definitely comprised of something very light. To Christen my new kitchen acquisition, the grill plate, I planned ahead to make some simple egg and potato sandwich. Baked a huge loaf of whole wheat bread with flax and other seeds the day before and that was put into good use. The sandwich was so scrummy that it vanished even before I thought of bringing out the camera. All in all a great day and to celebrate that I made this easy peasy Microwave besan sandesh or should I say besan laddoo. The idea or recipe is not mine and if you look closely you will se this arund many a blogs. The original recipe was from Bhatukli and yesterday I made that with sugar free for my diabetec elder brother. He loved every crumb of it. Its delicious and really melts in the mouth in all its true sense. Try making this right away if you have the three ingredients in your pantry and see it yourself. Hardly takes any time but as gorgeous as any fancy store baught sweets. 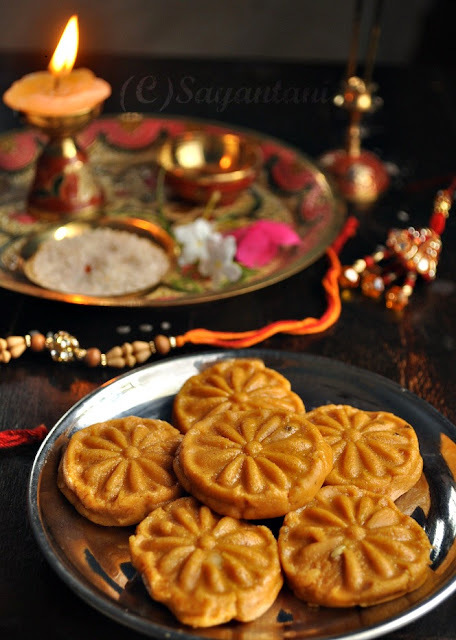 If you have sandesh mold try prettying them up like this and see your guests doing ooooh and ahhh over them. In a microwave safe bowl (microsafe glass bowl) place the besan. Add half of the ghee in it. With a spoon mix it so that its moist. Micro for 2 minutes, take out and stir with a spoon. Add the remaining ghee, mix and micro for 3 more minutes. Repeat taking it out at each 1 minute interval and mix it thorouly. By the end of this time the besan should couple of shaded darker and nice roasted aroma must waft from the besan. If needed micro it for another minute or two. I had to cook it for 5 minutes in total. Once you are happy with the aroma and the colour let it rest for 5-6 minutes or till it cools down a little to work with your hand. Mix in the sugar and powdered caradamom. Mix using your hands. Work the besan for 3-4 minutes. Divide the dough in 7-8 equal portions. 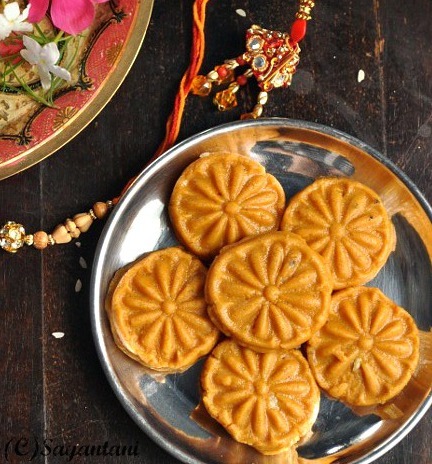 Either roll them in your palm to make laddoo or press on a sandesh mold. The original recipe says if needed add more ghee, I dint have to. the basic idea is to make it moist enough so that the laddoos hold shape. If you are storing the laddos make sure you place them on a butter paper or on a lightly greased box. Other wise they badly stick to the bottom of bowl. You can also place a raisin on the laddoos. sending this to Jagruti's Rakhi-the thread of love. besan. chickpea flour, besan laddu. laddoo recipe, easiest dessert recipe, indian dessert recipe, easy microwave dessert, microwave easy dessert recipe. 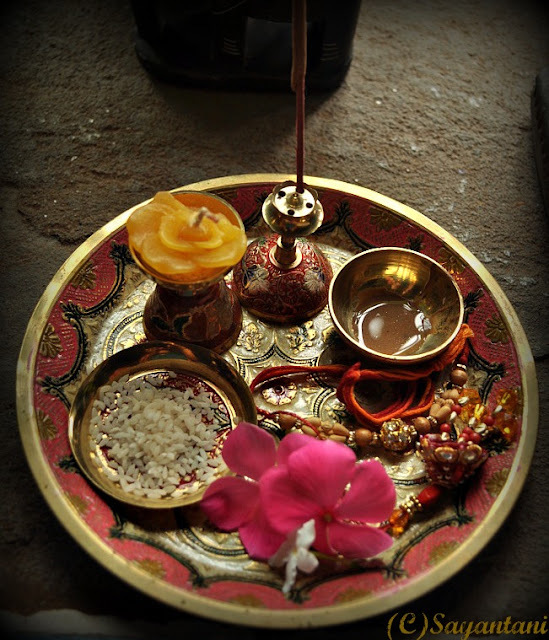 Love the thali,beautiful post,hope you all had a great time,beasn ladoo looks divine. Loving your pooja plate. The dessert looks so professional, especially the wheels on it. You nailed the shape. Your little cute is so cute.God bless him! Hope you had a lovely rakshabandan day. sandesh looks delicious... beautiful presentation.. I loved reading you Sayantani..Nice thali with all those nicely decorated stuff..Our traditions are all worth it ! 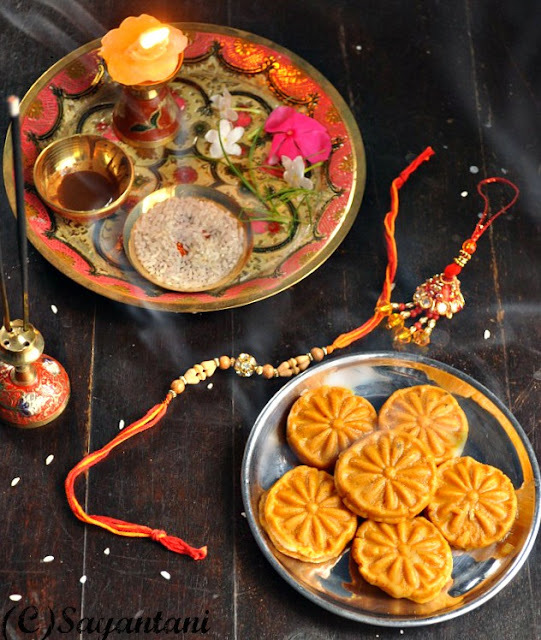 So cute and lovely pooja thali decoration..loved the sandesh shaped laddoo ..I willsurely try this .nice post dear!! Hey nice presentation. You have a very good taste. :) I have a question. Can we roast the besan in a kadai or wok? 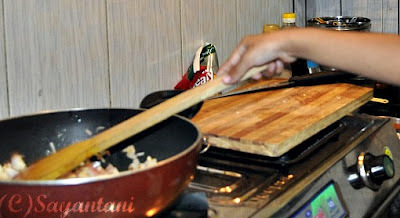 @Pratibha, yes you can definitely roast it in a pan. thats how it is generally done which takes a lot of time. look around in the net will get plenty of recipes for this cooked on stove top. He grown up, god bless ur lil darling. Such a beautiful sandesh,never thought of making sandesh with besan..Beautiful presentation. hey why don't you send it to my Rakhi event ? Jagruti, Thanks for your kind words. the puja thali is from Kolkata. look in the state emporiums, i bought it from there. would definitely send this to your event. Looks yum. How did you manage to make such delicious same sized sandesh. a mold but knowing you and your creativity I think you hand made it. Am I right? Archana, no dear I used a sandesh mold for this. why to put so much labour when it could be made so easily. thanks for your faith in me though. Looks so delicious. The boy's grown so much! Nice idea using a sandesh mould. I got fooled! Bookmarking the recipe. Sounds so delicious n nice presentation dear. Love to the li'l one! Beautiful post Sayantani !!! Love your beautiful and delicious Sandesh and such a beautiful put together rakhi thali. Always a pleasure to visit your space.Glad you had a lovely Rakshabandan and your little one had a great day as well. you share a lovely space, thanks for visiting mine, glad to follow you. 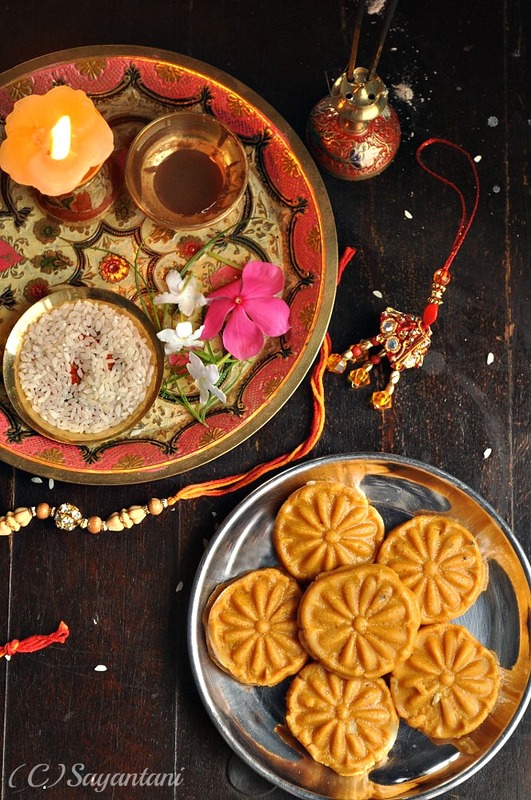 Khub sundar sajiyechho rakhi thali. 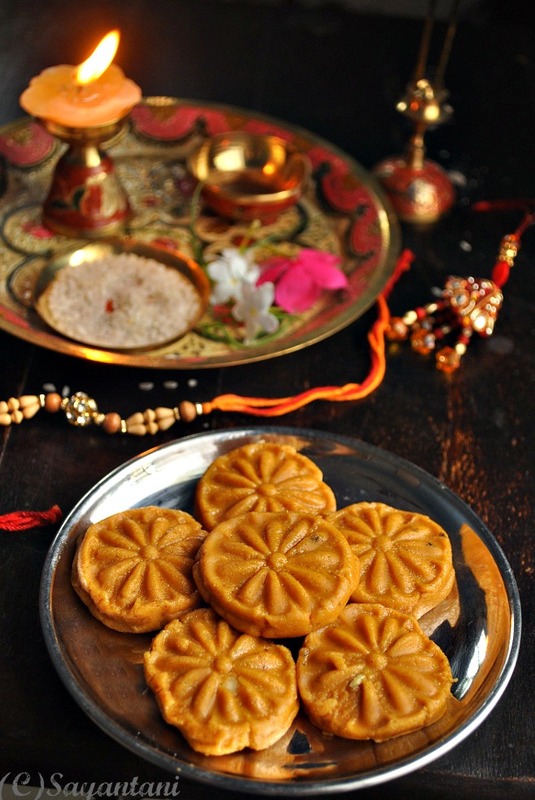 Sugar free besan sandesh looks delicious. Ribhu looks super smart boy.